The program contains an individual board graphic for each of these patterns. Solution 60 medium Sudoku puzzles with 8x8 cells and brickwall pattern areas (20 KB). 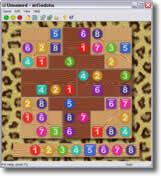 Solution 60 medium Sudoku puzzles with 8x8 cells and ladder pattern areas (22 KB). Solution 60 medium Sudoku puzzles with 8x8 cells and cross pattern areas (28 KB).